This morning Kade woke up saying his throat hurt. I let him stay home. It's not like he'd be doing much in class today since it's a short week. Plus I wouldn't mind having a shopping buddy for while running my errands. At Sam's I knew he wasn't feeling well because he rode in the cart the whole time and kind of looked out of it. Then Mickey came home early and Kade was bouncing around like normal. This didn't last too long because then he was vegging in front of the tv playing video games. In the afternoon he must have gotten more energy again because when I came home with the girls Mickey and Kade were out cleaning up leaves. It was Kade's lucky day. Mickey let him use the leaf blower. Here he is hard at work. His little tongue is sticking out. He was obviously really concentrating. 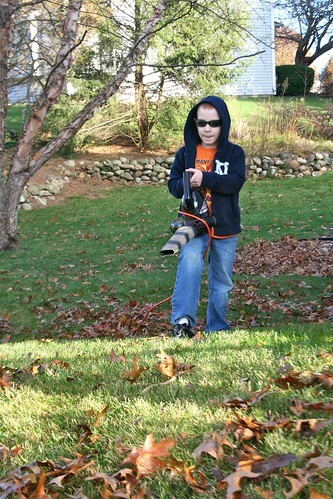 The leaf blower is a little heavy but he cleaned up a lot of leaves with it. He's a hard worker like his dad. After the hard work was done he came in and laid down. He was cold and didn't look great. He had a low grade fever. Later he complained of a tummy ache and then lost the contents of his stomach. This happened while we had company over for dinner. Luckily they have kids and didn't bat an eye. The weird thing was that he was back to normal a little while later. Like I said, weird.